Celebrate the heritage of two great, family-owned producers. Hush Heath are delighted to announce two unique, collaborative tours for 2019, showcasing the very finest of English produce. 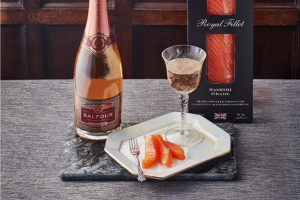 Join us for fresh Sparkling wine, paired with succulent London Cure Smoked Salmon, a match made in heaven. Meet the experts and gain a fascinating insight behind the scenes at our State-of-the-art Winery or the London Smokehouse. Uncover the mastery behind our wines and the history of the London Cure, whilst enjoying a tutored tasting of 6 premium wines and Salmon varieties, carefully paired to complement one another. There will also be the opportunity to purchase and take home the delicious range of wines and salmon you have tasted at a discounted rate. Places are limited so don’t miss your chance to get tickets!